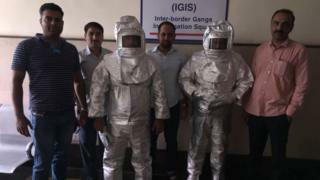 Indian police paraded a man and his son in "space suits" before arresting them for allegedly defrauding a businessman by pretending to work for Nasa. The duo allegedly convinced the businessman to buy a copper plate for $213,156 (£157,600), which they claimed had "special properties", police said. The men were arrested after the businessman complained to the police. The two men have not responded to the charges or commented on their public humiliation, which has caused hilarity on social media. Photos and a video of the father and son, dressed in silver space suits, being escorted by officials have gone viral. Police told reporters that they had passed off the metal plate as a "rare piece of copper", which was "struck by thunderbolt" and therefore had the power to pull rice towards it. They had further assured the businessman that the plate, which they called the "Rice Puller", could be sold to Nasa for around $5.5bn (£4.1bn). Police told Indian media that a "rice puller" is a "non-existent thing", but the conmen apparently coated the copper plate with "liquid magnet" and small iron wires to try to fool the victim.